There are a million logistics to consider when bringing a film production to film on location, but finding temporary housing for film production teams can be one of the greatest headaches you’ll face. Depending on the city, housing availability and the size of your team, you’re facing the possible prospects of premium rates to procure limited rooms, sometimes in locations that are nowhere near your set. By the time you’re done, your nerves could be fried, your bank accounts empty and your credit cards full. But never fear; with a bit of planning, it is possible to find comfortable temporary housing for everyone on your team with a minimal amount of effort and drama. Here’s how to go about it. Much of the stress involved with finding housing for large groups is actually self-imposed — because people didn’t plan ahead. They didn’t know exactly how many rooms they needed for the people they have, nor had they settled on a budget. Get this step done first; figure out ahead of time how many people will stay in each room or apartment — go ahead and assign roommates, if you can. Talk with your financial team to find out how much you can afford to spend on housing. Having this information on paper goes a long way toward smoothing the process. Next, do a little online or in-person reconnaissance of the area near your filming location. Where are the available hotels and apartment communities in proximity to your set? Identify a few potential neighborhoods to look at. Bear in mind that your short list doesn’t have to include only areas that are geographically close to your set; you can also look along major commute arteries. As long as your crew can get to the set fairly easily, you’re in good shape. Not only are hotels extremely expensive — they may have limited availability during your stay, and they aren’t comfortable for extended stays. Save yourself a huge amount of time and stress by working with a corporate housing company who specializes in providing temporary housing. This way, you may be able to work with one agent to procure fully furnished apartments for your entire film production team, all at a fraction of the cost of booking hotels for each of them. In addition, the burden of finding the rooms is off your shoulders! If you’re bringing a film production team to Atlanta, TP Corporate Lodging can arrange for your team to stay in fully-furnished luxury apartments convenient to your shooting site, all at affordable rates. Call us at 800.428.9997 to speak to an agent who can help with citywide locations and share their expertise of various areas. When you bring in a film crew on location to shoot a film, you’ve asked them to stay on for an extended length of time — for weeks or even months while production goes on. Finding comfortable film crew housing is one of the biggest challenges facing location productions, especially for low-to mid-budget projects. How do you keep your film crew comfortable without breaking your budget? Here are 5 important tips to consider when choosing film crew housing. 1. Avoid expensive hotels if possible. Booking hotel rooms for your gaffers, grips, PAs, production designers and other crew members might be the “easiest” choice, but expensive hotels can eat up your budget quicker than you realize — plus, extended hotel stays often cause traveler fatigue over time because it can be difficult to relax. (You may also need to allocate luxury lodgings to your actors if they’ve contracted for it.) Look for less expensive and more comfortable solutions, rather than just doing the thing that seems most convenient. The more of a home-like situation you can provide for your film crew, the better off they will be. They will rest better at night because at the end of a long shoot, they have all the conveniences of home. Having a stocked kitchen can help your crew do their own cooking so they can hold to their dietary requirements and stay within their budgets, and you can even house multiple people in a roommate format more easily. 3. Take amenities into account. A little pampering never hurt anyone. Hotels often offer amenities your crew members won’t even use, but an on-site fitness center, pool or picnic areas can also help your crew blow off steam and stay healthy. One option is to find furnished apartments in luxury communities that are available for the short term. These complexes often include amenities your crew will actually appreciate. 4. Look for convenient commutes. When it’s easy for your film crew to get to and from the set, that’s one less headache to worry about. It may or may not be possible to house them especially close to the set, but if they are housed near main arteries of the city in which you’re shooting, that’s the next best thing. Always take location into account when securing film crew housing. 5. 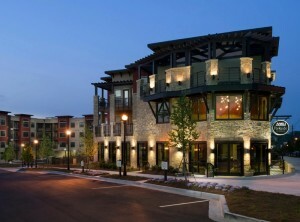 Consider working with a corporate housing partner. Corporate lodging companies specialize in providing comfortable, furnished luxury apartments for extended stays — all at reasonable rates. Working with this kind of partner also helps take the legwork out of finding enough quality housing for your entire crew, shaving potentially thousands off your budget and saving you many hours of time. Here in Atlanta, which has become one of the world’s most popular hotspots for film, TP Corporate Lodging can arrange quality housing for you and your crew. To learn more, call us at 800.428.9997. Procuring affordable film production housing can be the bane of the producer’s existence. When you need to bring in film crew members in large numbers for a location shoot, the default option is to book them all in hotel rooms, but that can be exceptionally challenging on tight budgets. The good news is that hotels aren’t the only housing option available; you can also satisfy your crew’s housing needs with quality corporate lodging. Let’s look at some of the major differences between corporate lodging vs. hotels to see how they stack up. Hotels are costly for what they offer. Corporate lodging gives you more for the money. With most hotels, the nightly rates are quite high compared to the space. The average hotel room is essentially a room with one or more beds, offered for nightly rates that are multiple times the cost of a rental apartment. In a word, hotels are sharply overpriced. By contrast, a corporate housing partner provides a fully furnished luxury apartment with a fully equipped kitchen, living space and room to relax. The cost: Typically less than a standard hotel room. Corporate lodging feels like home. After a few weeks in a stuffy hotel room, your film crew is likely to start showing signs of fatigue. They can be more irritable, less attentive and less productive. With extended stay corporate housing, your crew members have a comfortable place to live during film production — not just a place to sleep. They’ll be better rested, more productive and in better spirits on the set. Many of the amenities offered at hotels are things your crew members don’t really need. They can get their meals on the set; they don’t need a shoe shine because they’re wearing work boots; etc. You pay for all those amenities regardless of whether they are used. Corporate apartments offer conveniences your crew will actually use — like swimming pools, fitness facilities and outdoor grills. Many corporate apartments are also situated near prime shopping and dining areas, so in the rare event of a day off, your crewmates are steps away from all the conveniences they need. Here in Atlanta, TP Corporate Lodging can arrange for your film production crew to stay in comfortable, fully furnished apartments at surprisingly affordable rates. Give us a call at 800.428.9997 so we can discuss your film production housing needs. The film industry’s growing interest in Atlanta as a hub for production has had a profound effect on the local economy in recent years — including raising Atlanta’s demand for short-term production housing. A recent study from Film L.A. revealed that Georgia was the number-one location for feature films in 2016, outpacing even Hollywood. (California as a state came in fourth.) As the Atlanta Business Chronicle reports, Atlanta’s fiscal year 2017 saw a fiscal impact of $9.7 billion from film and TV production. Of that amount, direct spending accounted for $2.7 billion — a nearly four-fold increase in production spending compared to fiscal year 2007. Why is Georgia’s film sector growing? An increase in project-based production personnel. 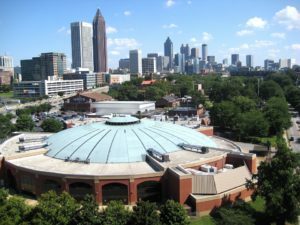 While Atlanta’s permanent film production employee sector is indeed growing, thousands of other industry workers come into Atlanta for specific film and television projects every year, sometime staying on for months at a time. Given the increase in available work, many film professionals are coming to Atlanta to live and work full-time. Some of these employees work at one or more of Atlanta’s growing number of soundstage complexes like Atlanta Metro Studios, Tyler Perry Studios or EUE/Screen Gems Studios. Some are hired on for specific TV series productions (e.g., Stranger Things or The Walking Dead). Many times, these people are called in last-minute and must often relocate quickly, leaving little time to figure out a permanent situation. Thus, many of these workers seek short-term production housing in the interim. Despite all the money seemingly flowing in from major film and TV studios, many indie projects still come to Georgia to shoot. These projects may hire industry professionals, but they don’t always have the budget to house them in expensive hotels. For these film productions, short-term corporate housing provides an excellent and cost-effective alternative. The benefits of living at home. Some transitional industry pros choose short-term housing simply because it makes them feel more at home than in a hotel. A fully furnished luxury apartment may offer a full range of amenities, including fitness facilities, security, close proximity to restaurants, etc. These apartments also offer fully equipped kitchens and well-appointed living spaces, so they can come back at the end of a long shoot and relax, just like they would at home. As Atlanta continues to gain prominence as a major player in the film industry, we can expect the need for short-term production housing only to continue growing for the foreseeable future. If you are a film professional coming into Atlanta for an extended stay, you have other options besides an expensive hotel with no place to spread out and relax. As an alternative, consider renting a fully-furnished corporate apartment while you’re in town, offering a full array of benefits at a fraction of the cost. To see what we have available for your needs, give TP Corporate Lodging a call at 800.428.9997. U.S. sailors in Naval Station Mayport in Jacksonville, Florida. 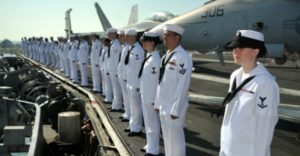 When men and women in the military service are in the midst of physically demanding training or a high-pressure assignment, dealing with the stress and details of a temporary move should be the last thing on their mind. And because military personnel and other government employees face certain rules and regulations regarding their accommodations, it’s important to choose a trustworthy housing partner that knows the ins and outs of these requirements. That’s where TP Corporate Lodging comes in. Our expert housing team is proud to support the U.S. and Allied military forces with top-notch temporary housing for personnel who are undergoing training in Jacksonville, Florida. As a major deep-water port, the city of Jacksonville contains multiple military facilities and bases. For military personnel that need to be located close to one of these facilities, TP Corporate Lodging offers many options that are just minutes away. Read about just a few of the premier Jacksonville housing complexes with which we partner. Best of all, every single one of our housing units is fully furnished and customized to meet the unique needs of governmental and military clients. Why settle for a hotel room when you can have a home? TP Corporate Lodging doesn’t only serve U.S. and Allied military personnel — our team also provides solutions for businesses and individuals looking for comfortable furnished corporate housing options in both Jacksonville and Atlanta. Why is corporate lodging a better choice for business travelers than traditional hotels or an Airbnb? In addition to being an overall more affordable choice, the home-like feel of corporate housing will make tenants happier and more productive. Happy employees mean happy companies! To learn more about our corporate lodging options for U.S. and Allied military personnel, don’t hesitate to reach out to TP Corporate Lodging by calling 800.428.9997. When you travel for an extended stay, whether for business or pleasure, renting a corporate furnished apartment can be more convenient and far less expensive than booking an extended stay hotel. However, every landlord is different and every corporate housing company is different, and you may have to ask a few questions to make sure the lodging will meet your needs. Here are 10 important questions to ask when you rent a furnished apartment. 1. Is furniture included in the rent? Just because the ad says it’s “furnished,” that doesn’t mean the quoted rent includes the furnishings. Some companies “bait” their customers by leading with the price of an unfurnished apartment, then including the furnishings as add-on expenses. You can get past this tactic by making this your very first question. You need a furnished place, so find out what it costs with the furniture in it. 2. What furniture is included? The word “furnished” is not a universal term. To some agencies, “furnished” means a table and chairs, bed, lamps, TV, couch and not much else. Other companies create a fully furnished apartment experience with all necessities included, even down to the decorations. Make sure the advertised price includes at least enough furnishings to make your place comfortable, pleasant and usable. Corporate Housing providers often have the ability to change out bed types to fit your need. 3. Are accessories included as part of the furnishings? For a truly comfortable living experience, you need more than a place to sit and a place to sleep. You need plates, cooking utensils, silverware, a mop, a vacuum cleaner, bath towels, etc. If the agency doesn’t make clear that these and other accessories are included, ask. Otherwise, you may be making a run to the store to get these things yourself. 4. May I have a list of included furnishings and accessories? Even when a company provides full furnishings and accessories, there may be still something you need that isn’t included. 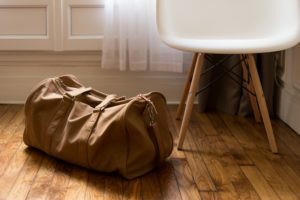 You’re asking this question for two reasons: a) to find out if there’s anything else you need to bring with you; and b) as an inventory so you can make sure you don’t inadvertently take something with you when you leave. 5. Is there an extra security deposit for furniture? Again, some companies separate their rent charges and their furnishing charges; same with the security deposit. Find out the true number so there are no surprises. 6. What utilities are already included? Most furnished apartments include utilities like phone, cable and wifi as part of the rental cost; others do not. Find out from the agency or landlord which utilities come with the apartment and which ones (if any) you’ll have to set up for yourself. Also find out what level of cable is included and if the Internet speed matches your need. 7. Is there an additional charge for utilities? This might sound like a repetitive question for number 6, but the fact that the utilities exist in the apartment doesn’t mean they are included in the rent! Make sure before you pick up the phone that they’re not charging you for phone calls, for example. 8. Can I choose furnishings? Most furnished apartments come pre-furnished, like a hotel suite, where what you see is what you get. In other cases, you will be given a choice of furnishings. In still other cases, the agency may be able to get you a piece of furniture you need that isn’t already included. Ask how the company handles these details. 9. Will there be pickup/delivery of furniture, and how does that work? If your apartment is strictly pre-furnished, this question is a non-issue. If, however, you’re choosing furnishings and/or mixing and matching, it’s important to know if drivers will install and assemble pieces, or if you’ll have to do some assembly yourself. 10. Any other costs I should know about? You’d be surprised at how many hidden fees some companies hide in their agreements. Don’t be surprised. Ask up front for all costs to be disclosed before you sign. If you’re looking for a high quality, comfortable furnished apartment in Atlanta, Georgia or Jacksonville, Florida, TP Corporate Lodging works with some of the finest apartment communities in both cities to provide fully furnished 1, 2 and 3-bedroom apartments for business travelers and extended stay guests. And furnished apartments are all we do, so you know it’s included in the price! To learn more and have all your questions answered, please give us a call today at 800.428.9997. The TP Corporate Lodging team is thrilled to be featured in KNOWAtlanta, the premier Atlanta relocation guide for corporate executives, families, and individuals making a move to the area. With the rise in popularity of short-term rental platforms like Airbnb and the range of extended-stay hotel options in a city as big as Atlanta, choosing a corporate housing provider may not be on the top of your list when considering your temporary housing options. But while you may be able to score a deal through a private rental provider, there can be drawbacks to not working with an accredited and certified housing provider. And while extended-stay accommodations may fit all your needs in the short term, the prices can quickly skyrocket. How much do those prices skyrocket, you ask? Take a look at our cost comparison charts to see just how much money your or your corporate sponsor could save by choosing TP Corporate Lodging. Why settle for a hotel room, when you can have a home? Furnished temporary housing is convenient not only for relocation, but also for extended project work, medical visits, and insurance-covered displacement. When you’re ready to start your search for furnished temporary housing in Atlanta or Jacksonville, TP Corporate Lodging can assist you in finding the perfect 1, 2 or 3-bedroom furnished apartment for your unique needs. To learn more about how we can help, call us at 800-428-9997. Each year, CHPA profiles the newest members to join the Board of Directors in order to highlight their path to leadership and help members get to know them a little better. Read more about Billy Cochran of TP Corporate Lodging below. You can also contact him at the information below. In addition to now serving on the CHPA Board of Directors, Billy has dedicated many hours to several CHPA committees and task forces. He was also awarded the Individual of the Year Tower of Excellence Award in 2011. Atlanta, GA November 2013 — TP Corporate Lodging, provider of short-term corporate housing in the Atlanta, Georgia and Jacksonville, Florida areas, has expanded into the Miami/Ft. Lauderdale, Florida area. As one of the largest providers of corporate housing in Atlanta and Jacksonville, TP Corporate Lodging sees this move both as a strategic step for the business and a way to better service its current clients while also expanding its customer base into South Florida.